One fine Virginia day we head to the town of Monroe to go visit an old friend. Monroe is a good distance away via the Blue Ridge Parkway. 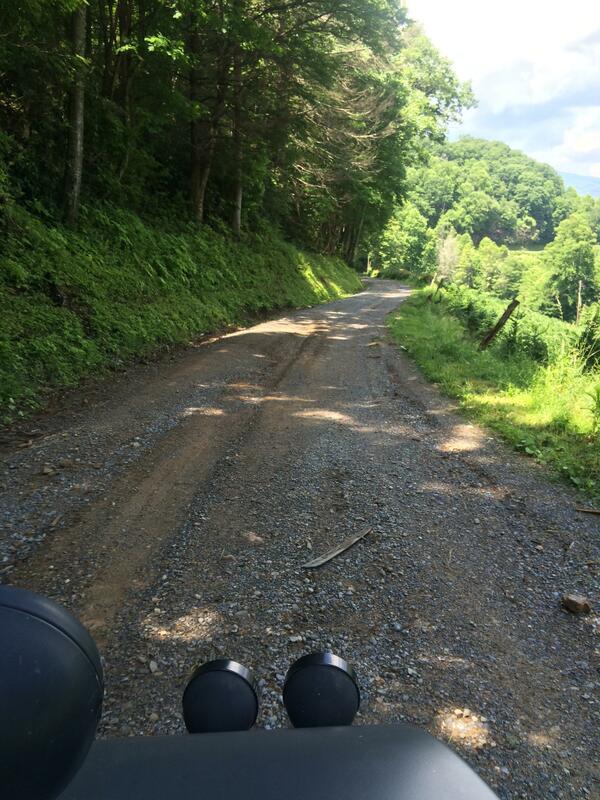 Any day riding the Blue Ridge is a good day. Off the Blue Ridge, we find an interesting old church. We reach our. destination in Monroe. This is a little cafe that we accidentally found last year. 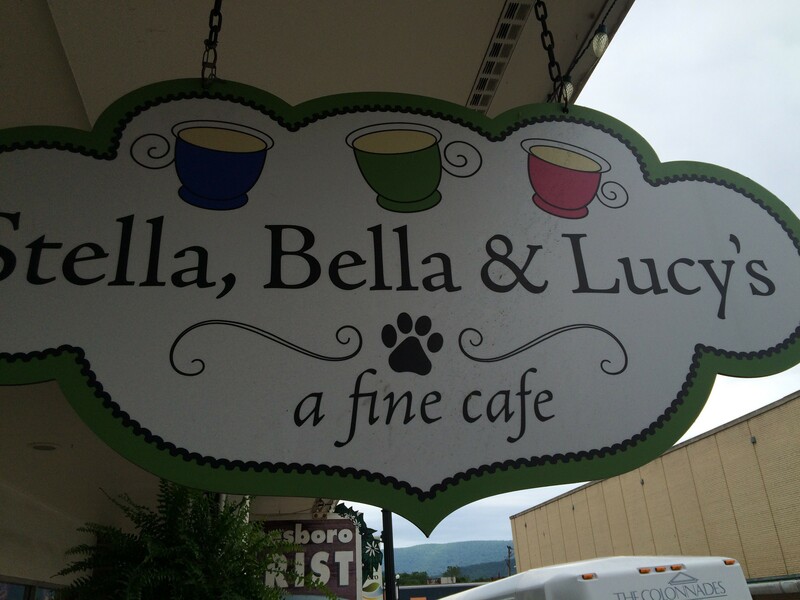 This is a family operated cafe by some of the nicest people one could ever meet. The matriarch is Mary. Mary is 98 (I think) and she holds court at a large round table near the back. 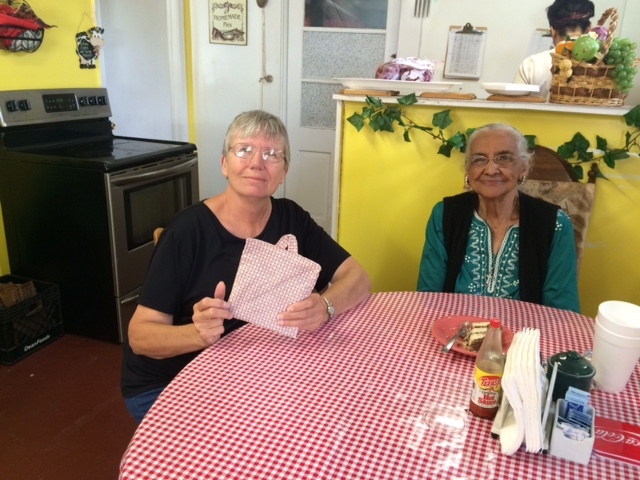 All are welcomed at her table and she loves to tell stories about her youth and this little pie shop. Mary make pot holders to give away to her friends. I use the term friends loosely. Mary considers everyone her friend, but we still are proud to be considered her friends. Anyway, last year she gave Tree a potholder that she in turn gave to one of our sweet daughter-in-laws. So Mary gave Tree a new potholder made with love. After our visit that included consumption of an ample amount of homemade pie, we head to the town of Amhurst. It is supposed to be a cute town plus there was a farmer’s market Saint wanted to go to. After we reach Amhurst, the heavens open up and we were caught in a heavy downpour. We duck into a restaurant for cover and a cup of coffee. After the rains paused, we tried to make a dash for home because the forecast looked like more was coming. On the outskirts of town, the Goose sputters and dies in the middle of a major road. Got gas, all loots AOK, but there is no life in the engine department. I call roadside assistance and am assured that someone will come within the next week or so. I am finally able to get Goose out of the road and to a store front. I look up at the store sign and notice that I have broke down in front of an ice cream parlor. While waiting for roadside assistance I figure out that the storm had gotten water in the ignition switch. I take it apart and dry it out. Once reassembled Goose is ready to go. In the meantime, roadside assistance calls to tell me they have not been able to find anyone to come get us but they are still working on it. I tell them to screw off. 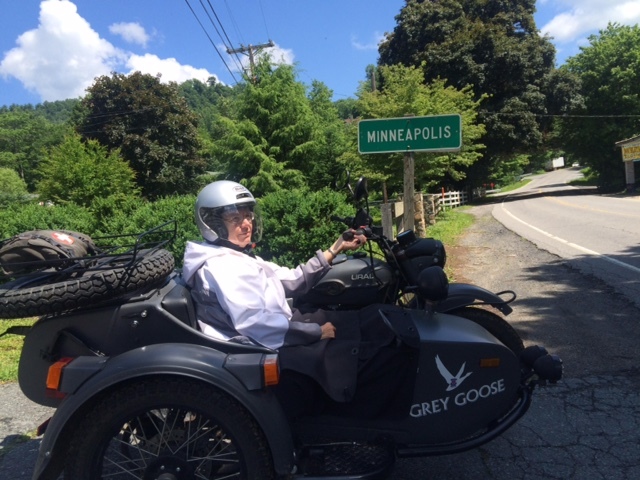 The Saint, the Goose and I head home. 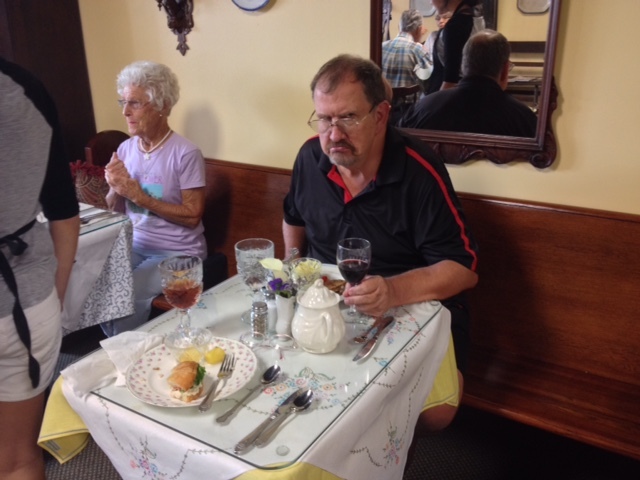 In the nearby town of Waynesboro there is a tea room that I had sworn that I was not going to. We went there last year and once was enough. And that’s final! I am not going to a frilly tea room. NO WAY can you make me go again. On another fine day we go to Wade’s Mill near the town of Raphine. At the mill, I get me some fresh yeller grits to replace the last package that walked away. This makes me happy. I like yeller grits. My crapy low memory iPhone won’t let me do but a few pictures at a time, so I am having to break this post into multiple parts. Please excuse. 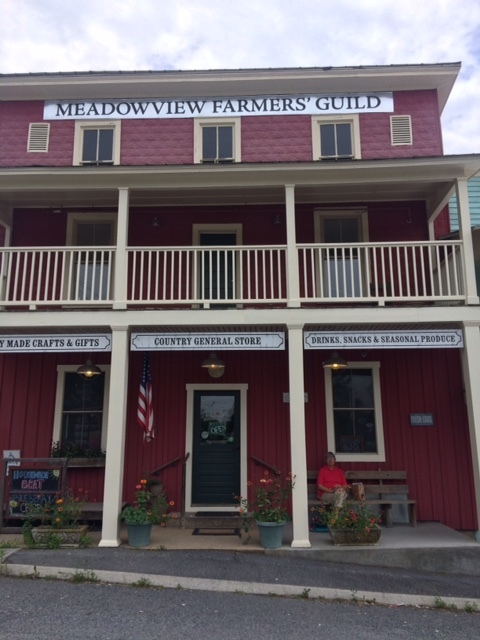 There was a place in the tiny town of Meadow View, VA that has been writ up in Southern Living that Tree has always wanted to go to. Low and behold, we see the exit sign for Meadow View so we give it a shot. We find the place easily enough and there is a big spot across the street to park the RV, so all is good. Thee Saint is now happy and has forgiven me for leaving North Carolina. We have a very nice meal in an interesting place and continue our journey. 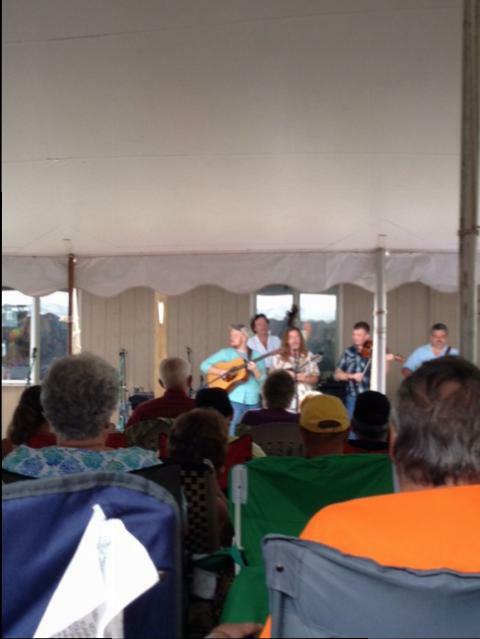 After a long day of driving we arrive at our destination – Stoney Creek RV Resort in Greenville, VA.
We have arrived in time for the annual Blue Grass Music Festival. We set up site and head over to pavilion to listen to the music. We spend this night and all the next day to blue grass. By time this event was over I heard enough blue grass to last a lifetime but it was a fun event and we thoroughly enjoyed ourselves. 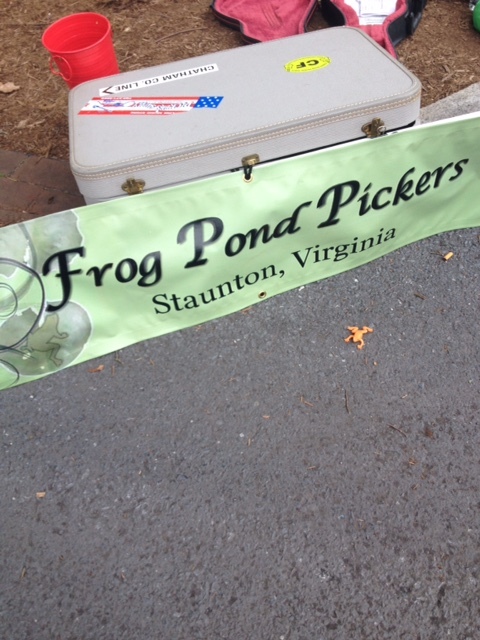 One morning Tree and Froggy (Ky’s new name) head to nearby Staunton for the farmer’s market there. 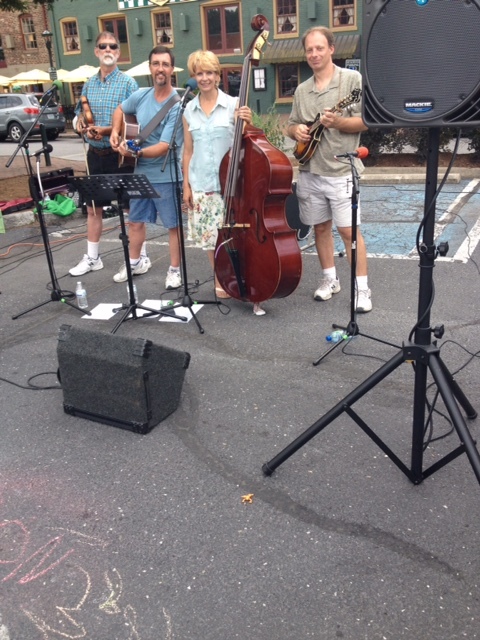 While at the market, there was a group playing, guess what kind of music? Anyway, Froggy liked this blue grass band. Froggy even talked them into a group picture with him front and center. 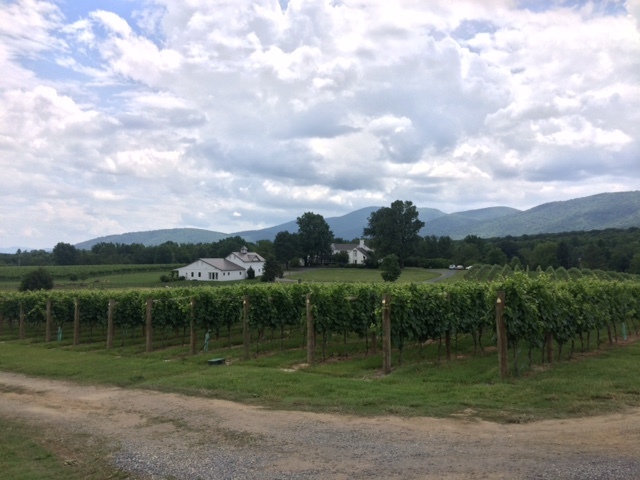 In the nearby county of Nelson, there is a state highway 151 that for some reason has a large collection of wineries, breweries, etc. the collection is called “Nelson 151”. 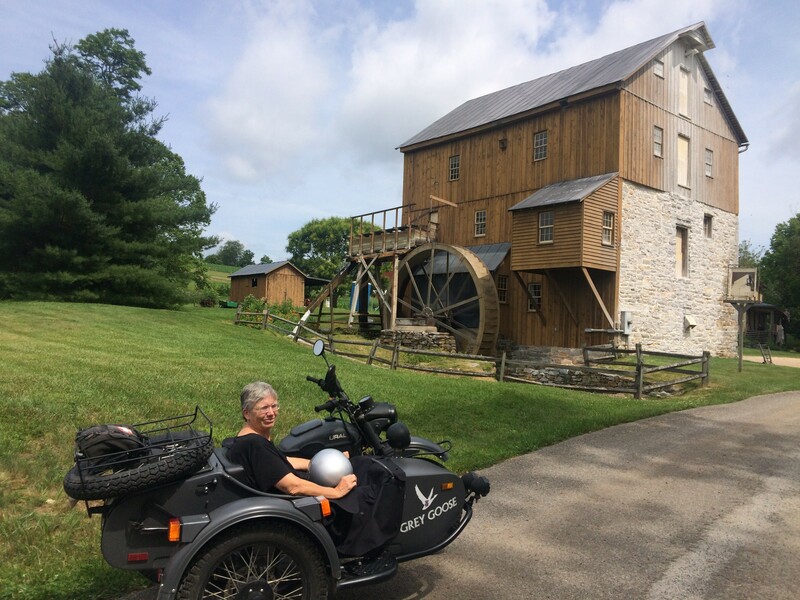 We take a fun route that included the Blue Ridge Parkway and other fun roads. 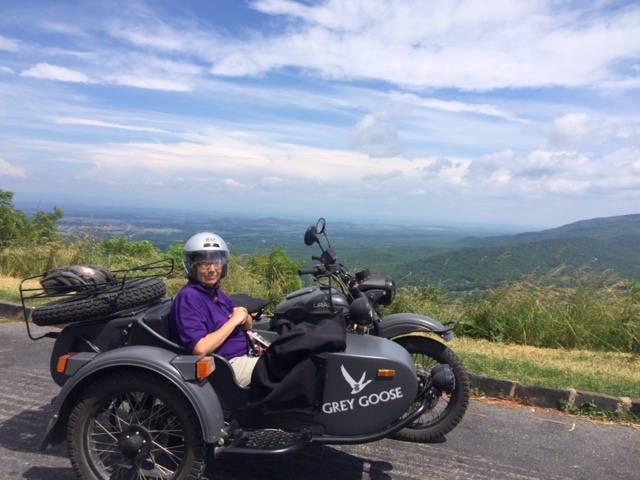 While in Virginia, we also take a ride up Skyline drive. I developed what I thought would be a neat route going up to Tennessee then to Roan Mountain from the north side. From Tennessee I select a fun back road trek to the mountain. All starts off nice with a well maintained gravel road as shown. Then becomes narrow and not maintained. By the time we are just hanging off the side of a mountain, I am informed that we are not doing this anymore. So we backtrack in search of pavement. We find that hard stuff and ascend the steep road to the summit. Roan Mountain is almost as tall as Mount Mitchell making it one of the tallest points east of the Mississippi. 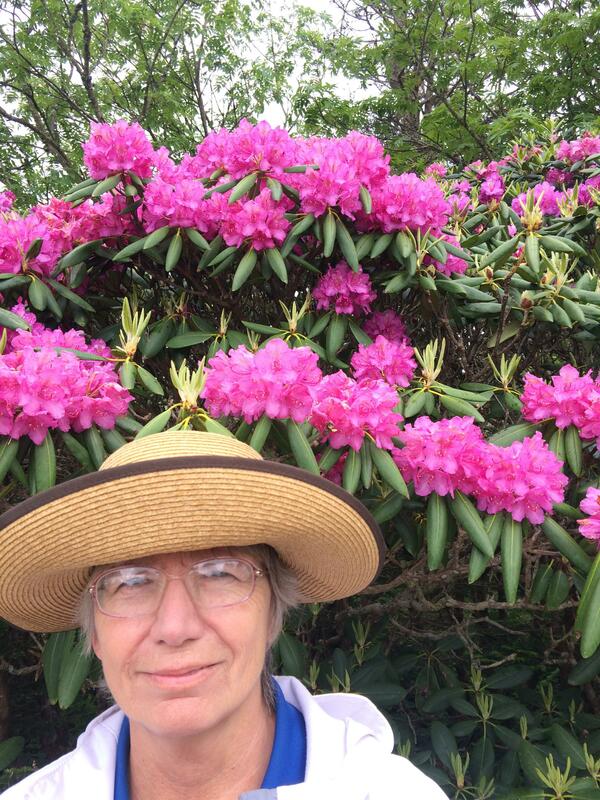 The primary reason Tree wanted to come here was because of the rhododendrons are in bloom here. 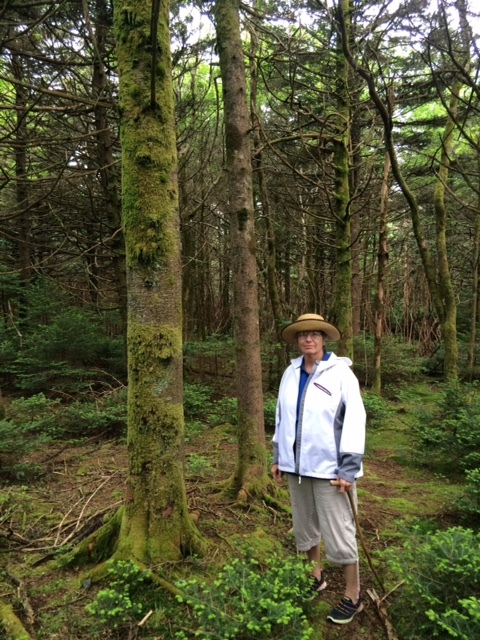 After looking at flowers, we tour the “Roan Mountain Gardens” which is a maze of sidewalks though a rainforest. 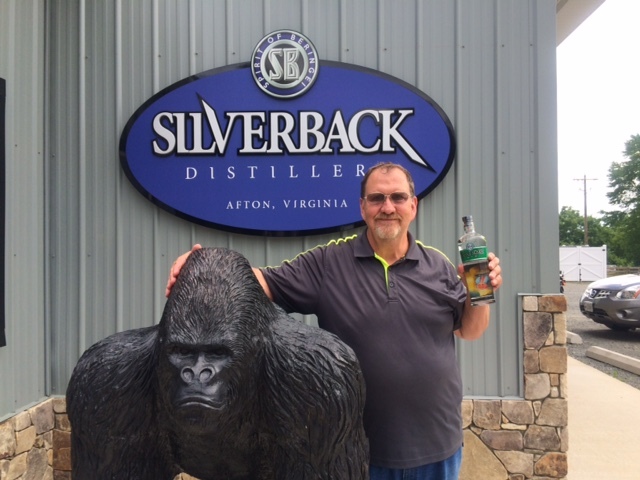 Back at our temporary home town (Plumtree, NC) we stop for a photo op. This is the site of an old movie called “The Winter People” staring Kurt Russell. These buildings were in the movie. When we learned this, we downloaded the movie and watched it that night. Movie was so-so at best but it was neat we were staying where a movie was shot. In the morning we say goodby to North Carolina and hello to Virginia. It is difficult to maintain a good trip report using an iPhone so all this time I was waiting until I had wifi and could use my laptop to write reports. Then it would take hours to catch up. Problem is that we have not been at a campsite where we have wifi for a while and looking at our future itinerary it is unlikely that we will have wifi for some time. II could continue to go to some location like coffee shops and such to write reports. But then I am sitting around writing reports during the day when I could be sightseeing and riding the goose. So I’m going to play a little catsup using my iPhone in a very abbreviated manner with limited, if any, pictures. When we return home, I will do a proper post complete with lots of pictures. OK, I got a big behind on my reports. So, I will attempt a little ketchup. A good friend of ours, Kat, had a friend that had just opened a shop in the nearby town of Burnsville that she wanted us to go say hey to. I don’t need much of an excuse to take the Goose on a road trip, so off we go. 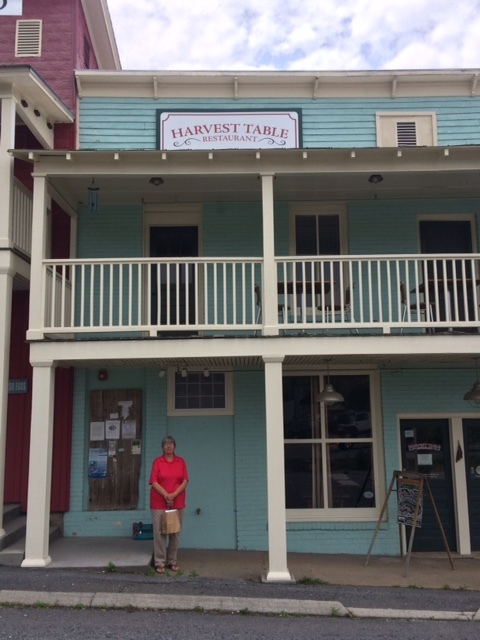 Last year, we had found a really neat restaurant called ‘Over Yonder” in the village of Valle Crucis near Boone, NC. So we wanted a repeat performance. Along the way we discover that they grow a LOT of Christmas trees in this area. I make another attempt at doing the Continental Divide. Even Thee Saint joins me. She not scared. I don’t’ know anything about this, but this is what we find in Goo Goo. Some pictures of pictures inside the restaurant that I am going to pass off as our own work. Across the street is a place called “Mast General Store”. 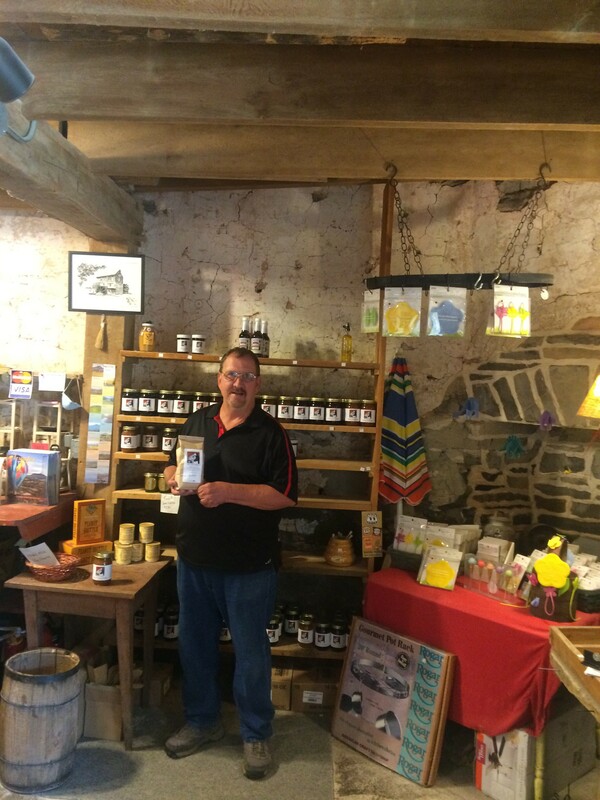 This is the original location for an old time general store that is still in operation today. We find a winery! I like wineries. One day Tree tells me we would like to go see a place called Flat Top Manor. 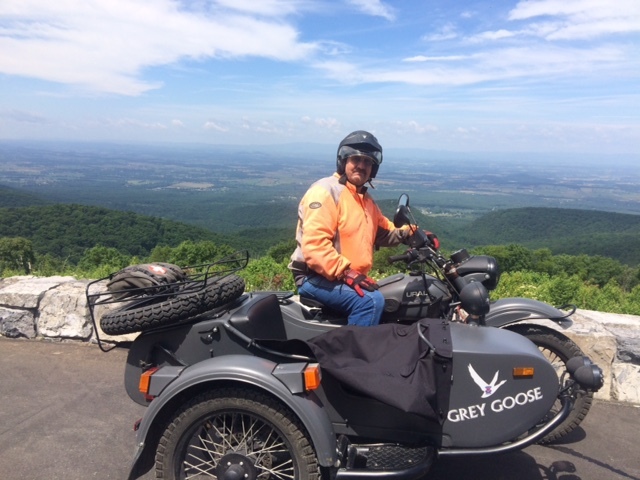 It’s just off, the Blue Ridge Parkway and I like riding the Goose on the Parkway – so off we go. I see a sign for a place called “Linville Falls”, so I think it would be neat to take a side trip to go see. Upon arrival, we are told by the park ranger that we just need to go down this nice path to the falls. I attempt a selfie to prove that I was there. Tree gives up on me and wades through the mud and makes it to where I am. Parkway Craft Center”. It seems this place has an identity crisis and cannot decide what its name is. Anyway, it’s an old manor that has a bunch of overpriced crafts for sale, but the house and setting is very pretty. On the way, we stop for lunch. Thee Saint had made us some nice sandwiches to have for a parkway picnic. She had put our lunch in the refrigerator to stay cool until right before we left. As Tree unpacks our lunch, she remembers that our sandwiches are still in the refrigerator. Oh, well at least we had apples. We arrive at the house of many names. Afterwards, our apple lunch has worn off and we head to the town of Blowing Rock to find lunch. We find a place called “Town Tavern”. The place looked a little dumpy on the outside, but we were pleasantly surprised by the good food. 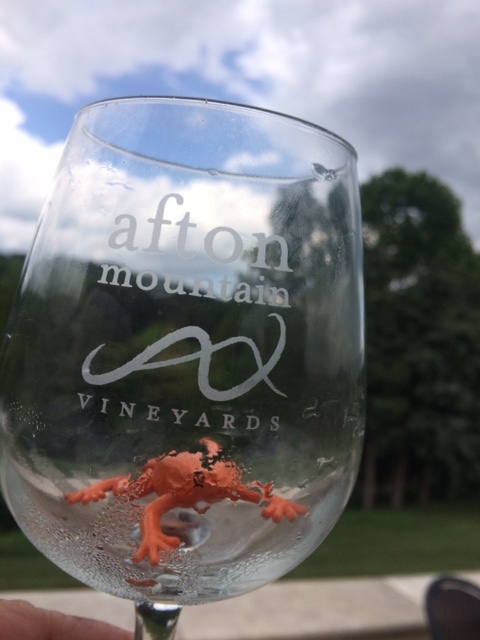 Ky, had a liquid lunch. 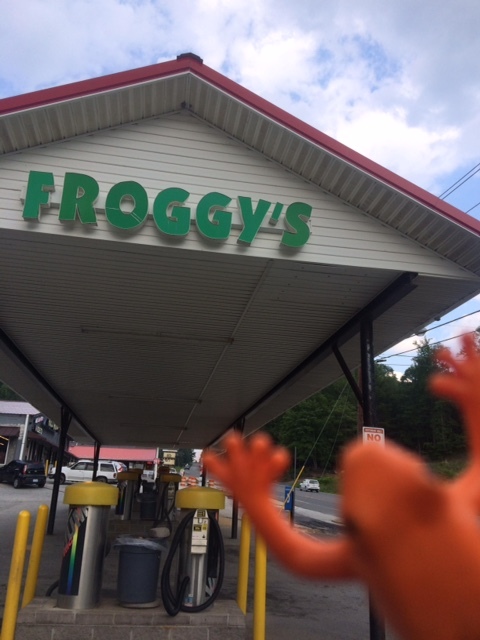 After lunch, we remember a place that we had gone to last year called “Froggy Rock” so we thought it would be neat to go have a picture of Ky (our froggy) in front of the place, so I fight traffic and road construction to find the place. We go to all the trouble of posing these neat pictures. Hey did you notice our goof? After we took the pictures, we decided that we were too dumb to live and head home. Our campsite on a fine North Carolina morning at Lake Powhaten. I’m told it’s a nice North Carolina morning to take a run up to Pisgah again for lunch. Oh, let me tell you a little something about nice North Carolina mornings. They tend to be cool or if you are from Texas, one might use the word cold. We turn on the heat every morning and yes this is June. In Texas, we are used to turning on the A/C in June. Riding in the Goose in the mornings here will require one to bundle up for the trip and then shed off layers at the day heats up. Higher we go, the more in the clouds we are. By time we reach Mt. Pisgah, we are engulfed in clouds and fog. As we ate with a view of the Valley of Mt. Pisgah below, we were treated with watching the cloud lift revealing the spectacular scenes below. Time to head back down the mountain. Later that day, guess where the Saint wants to go? You guessed it. Biltmore!! I drop her off at the big house and expend some time at the Biltmore winery. Gee, before long, you’ll may think I’m a wino or something. It’s late afternoon and on the way to the winery area, the geese are just getting ready to call it a day. After I pick her Saintness up, I have this bright idea to hike up some place that is supposed to have some neat statue of the goddess Diana. So, a-hiking we go. Now some of you “real” hikers may laugh at what I call a hike, but I’m 67, overweight and out of shape so having to go from one bar to another is a hike. Anyway, up some dumb hill we go. Up a flight of stairs, we have a nice view of the estate, but we are facing the sun that low in the sky so the picture does not come out well. We hike on and reach the top of the hill to find this statue. The Saint proclaims “You had me hike up this hill to see this!” As well as other expletives, not appropriate to repeat. Walking around the grounds of the estate. For our last day in the Asheville area, we go to Biscuit Head for another bisuit breakfast. Some where less than 9,000 calories a biscuit. Next to Biscuit Head is a music place that had the misfourtune of naming ttheir place ISIS before ISIS was a bad thing. 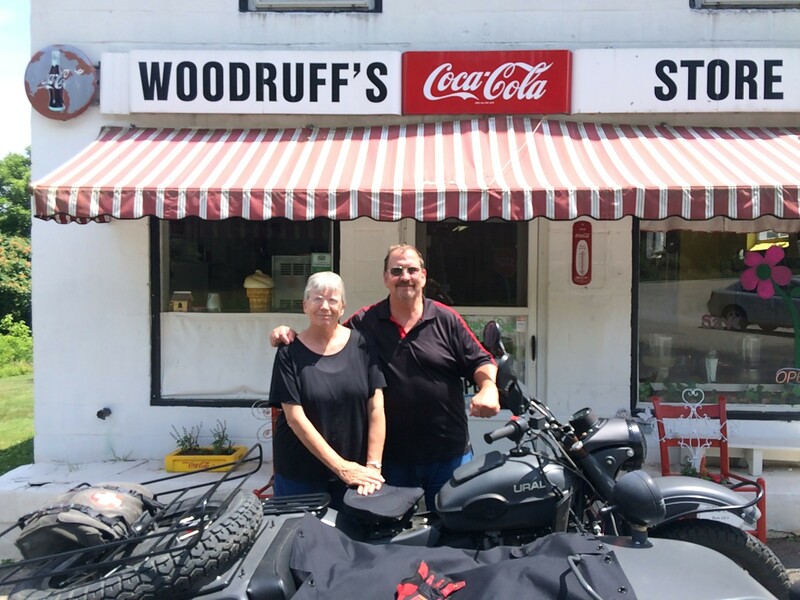 Later that day, we hook up our home and head north about 60-70 miles to a little town called Plumtree, NC. We go to an RV park called “A heavenly getaway”. I liked the description on the website for this park. I wish I had read the reviews on this park that warned that this was a difficult place for an RV of any size. 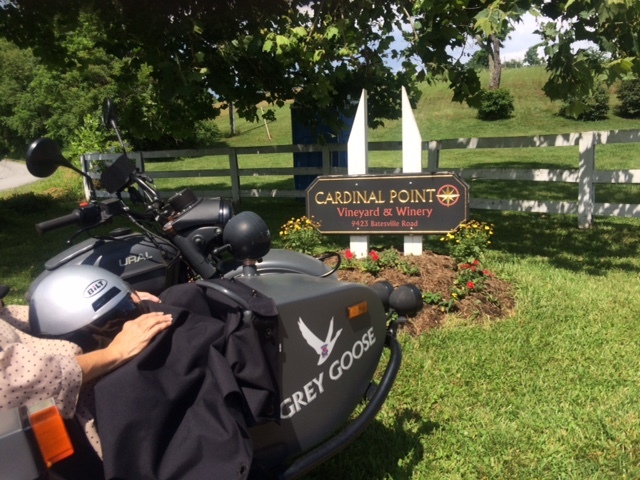 We ended up goind down a road, over a small bridge then a steep incline to the park that would have been a strain on the goose but maneuvering a 26’ trailer and a full sized pick up was interesting to say the least. By time I got backed into the site they has set for us, I was ready for a large tall stiff drink. By time I got our rig parked, I had other names for this place and it was not heavenly. By the next day, I had recovered, so for lunch we head to a little mountain town called “Little Switzerland”. There was a big fancy motel there with a nice restaurant that had been recommended. But the entire hotel, restaurant and grounds had been booked for a wedding, so we had to go to the downtown area of Little Switzerland (all of three buildings) for lunch today. We did however have a fine luch. I attempt to find us a nice route home down the road less traveled. Saint however is not comfoprtable that I have a clue as to where I am or where I am going. I find our way back to the Blue Ridge Parkway and we find another restaurant with nice views, so we stop in for coffee and dessert. On the way home, we come across an orchard called Altapass. Apples are not in season, but what the hey, we stop to take a look-see. Boy, what a treat. They were having an AARP dance. By AARP dance, I’m meaning they had a nice band playing good old time music with many silver haired folks kicking it up. And then there was this lady dancing with her dog. Old people are strange. As previously stated, our current camp is at a small town called Plumtree. It has a post office but is not a real town that you can find on a GPS. The only business is a winery and brewery called “Blind Squirrel”. On previous pass-bys we had dismissed this place as a dump, but one evening we decided to give it a try. Outer looks can be deceiving. It was actually very nice and we had a pleasant time, the food was good and the beer was even better. Ky had a bit too much and had to take a nap in the table arrangement. One morning, we head to a strange little place in Asheville called Biscuit Head for breakfast. As you might of guessed, the main fare was biscuits, But BOY! What a biscuit! They had a good price on a pitcher of grapefruit mimosa. I figured the pitcher was small. I figured wrong. They used an entire bottle of champagne then a little grapefruit juice. We were, however, up to the task. The pictures on the restroom were interesting. From there we head downtown, find a place to park and take a walking tour. Asheville has a lot of old buildings and churches that are interesting. Its starting to rain a bit, so Ky finds us a good place to duck in until the rain passes. Ky likes chocolate. I don’t know why, but Asheville is famous for having a lot of micro-breweries, so we go off in search of the Asheville Brewing Company. I have a beverage while hunter relaxes a bit from all this walking. Ky kicks back a cold one to wash down the chocolate. On another day, would you believe that the Saint wants to go see the Biltmore estate AGAIN. Prior to coming here this year, Tree bought an annual pass so that she could go as often as she wants and she is determined to get her monies worth. Me, I toured the house last year and while interesting, once was enough and certainly not worth $50 a pop. But anyway, I drop Thee Saint off at the estate and I head over to the winery to wait. I can think of a lot worse places to wait than a winery. After Thee Saint summons her chariot, I return to the estate to pick her up. We obtained a “drop off” pass that lets me go right up to the front door of the estate. I also think a lot of people thought the Goose was part of the attractions there. Afterwards, we head back to the Antler Village farm area. There, among various agriculture demonstrations, was a blacksmith making items. For demonstration, he makes a key chain doodad and I had seen part of this demonstration last year but didn’t buy the doodad. By doodad, I’m referring to the charm like thing that one puts on a keychain. I wanted to call it a fob but management (Thee Saint) tells me that fob only refers to those devices that will lock and unlock your car. Se tells me it is called a charm. We men don’t have charms, so I am going to call it a doodad. I later regretted not seeing the full demonstration or buying the doodad last year. He makes the key chain fob, then offers it for sale. Of our previous visits to Biltmore this year, I would drop by the blacksmith shop but it was closed. Today, he was in so before a demonstration even began, I told him I traveled over a 1,000 miles to come back here and the next doodad he made was mine. Expert craftsmanship and I watched the making of it from a rod of steel. I am quite proud of my key chain doodad. After the making of my doodad, the blacksmith treats us to a anvil melody. He actually plays a tune with hammers Striking the anvil. I took a video but wifi at my current location is too weak to upload a vide. So for now, you will have to believe me. Before we leave Biltmore for the day, we stop at Cedric’s for a refreshing beverage then tour around a bit. Guess what! There are flowers that Thee Saint likes to look at. I earn brownie points by taking Tree here. We had visited this place when we were here last fall, but not much was in bloom. This trip, the gardens are in full color. We take a trip to Asheville again and to enjoy a nice lunch at a sidewalk café. We got through most of the meal fine, but then it started to rain. Oh, let me take a moment to tell you about rain here. We may have left the floods in Texas but we get to see a lot of rain. It rains here EVERYDAY! There is a reason, everything is so lush and green here. Seldom is the rain heavy nor does it last that long. It is usually nice during the day and then by late afternoon we will get a shower. Today, however, the rain came early and heavy. Ky was OK with the rain, but after all, he is a frog. Hunter and I, however, were ducking for cover. To get in from the rain, we find a “dog friendly” book store. By the way, Asheville in general is very dog friendly. Many stores in the downtown area have water bowls out front for those walking their pets and most allow dogs inside their shop. Anyway, this book store was the “Battery Park Book exchange and Champagne” Books and champagne – how could you go wrong? We all get a beverage and find some reading material. Ky grabs a copy of “War and Peace” and reads aloud for Hunter. After reading time, Hunter is tired and decides to take a nap. We return home after the rains stop and after Ky has finished reading “War and Peace” he knocked out “Around the world in eighty days“ and was starting on “North and South” when we told him it was time to go. Did you know that frogs can pout? Next day, Tree tells me we want to go in search of more flowers on the Blue Ridge Parkway. I’ve had enough of flowers, but I’m here to please (and I like the Blue Ridge), so off we go. It looked like rain so we took the truck. Oh, another word about the rain. We have since figured out that it is going to rain every day and that the rain won’t kill us, so we take the Goose even if it looks like rain. 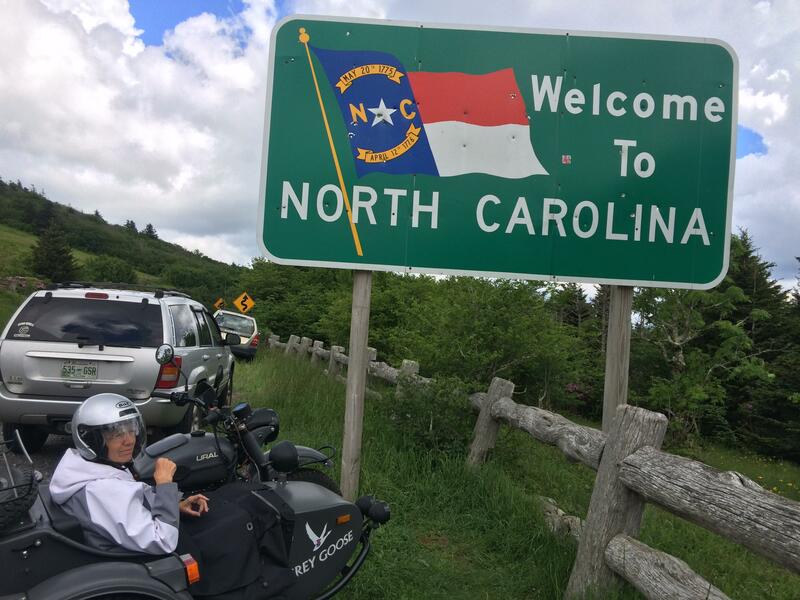 Anyway, we head to an area on the Blue Ridge called “Craggy Gardens” to see the rhododendrons that should be in bloom this time of year. We arrive at the picnic area for Craggie Gardens and the rhododendrons are in fact in bloom. Hunter is not impressed and lets us know what he thinks about these flowers. Regardless of Hunter’s feelings, the flowers were nice. It is early June, but if you can see the temperature in the truck dash – it is 59 degrees. A bit chilly for mid day in June. Next we head to Mt. Mitchel State Park. Mt. Mitchel is the highest point east of the Mississippi. Now an overlook area named after me. We drive, up, up and up and we reach Mt. Mitchel park. We stop for a nice lunch at a restaurant near the summit but within the state park. Some great views from our dining table in the clouds. After lunch, we hike up a trail leading to the summit and observatory deck. Some shots along the hike. We reach the summit. It was a long hike and Hunter and I are pooped. We descend the trail. Boy, going down is much easier than going up. We head home. More tunnels and great sights. Back at our campsite, I join Smokey in some fire prevention. For our last morning here at the park (Pride Resort, Waynesville), we go to nearby Maggie Valley for breakfast. We seldom go out for breakfast, but this place was famous for their pancakes so we had to give them a try. Normally we would have left this park this morning but we are waiting for the cable to arrive. All the UPS tracking tells me is that it will be here by end of day, so I make arrangements with the park to allow us to stay here until our package comes in. In the meantime, we load back into the truck and head back to the Chataloochee area because Thee Saint wanted to see some of the old buildings that Hunter and I saw during our adventure. There are supposed to be a lot of elk in the area and we had hopes to see some, but I guess it was too late in the morning for them to be out. We did, however, see lots of wild turkeys. We head back to our home site and await my care package (cable for the Goose) and enjoy a leisurely day. The package arrives late that afternoon, so it is time to head out. Today we go to a national park area called Lake Powhaten Recreational area. We set up our new home site, light up a campfire and sit back and enjoy nature. I spend the morning replacing the clutch cable on the Goose. I spoke on the phone with a fellow Ural rider that gave me some pointers of how to replace the cable. Amazingly, I was able to replace the cable and make all the needed adjustments myself, so THE GOOSE RUNS AGAIN! Lake Powhaten is actually just outside of Asheville, so of course we make a day trip to the downtown area. Parking in downtown Asheville is difficult so we bring the Goose because it is much easier to park. Besides, taking the Goose is always more fun than a dumb truck. Ky is up to no good. I don’t know why we even bring him. We make another (of many yet to come), trip back to Biltmore. This time, we just go to a place called “Antler Village”. This is a little area within the Biltmore grounds that has the winery, a museum and some nice resturants. We had dinner at a place called “Cedric’s”. Cedric was the name of the Vanderbilt’s pet St. Bernard. There is some live music playing in the courtyard area that we get to enjoy while dining. The above will show current tracking of Beemer Bob's current location and route.